Bob`s Red Mill Gluten Free Oat Bran Cereal is made from oats grown with great care on some of the finest oat-growing fields in the world. 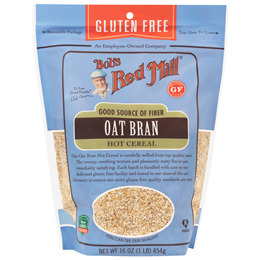 The oats are packaged in Bob`s Red Mill 100% gluten free facility and tested for gluten again to ensure their purity. 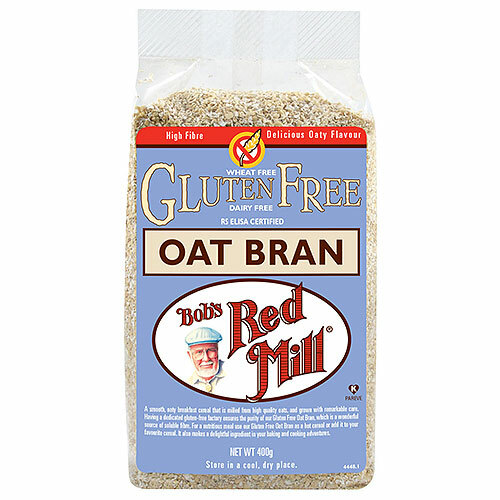 Bob`s Red Mill Oat Bran Gluten Free Cereal is a deliciously smooth, high fibre cereal milled from high protein oats. Oat Bran makes a wonderful hot cereal or addition to baked goods. Oat bran is terrific in muffins, where it adds a very distinctive texture and rich, nutty flavour. Try adding some oat bran to bread dough to increase the fibre content, or sprinkle some on top of a finished loaf before baking for a nutty topping. Below are reviews of Bob`s Red Mill Oat Bran - 400g by bodykind customers. If you have tried this product we'd love to hear what you think so please leave a review. Bob`s Red Mill Gluten Free Oat Bran Cereal is made from oats grown with great care on some of the finest oat-growing fields. The oats are packaged in Bob`s Red Mill 100% gluten free facility and tested for gluten again to ensure their purity.